Your property and facilities are a major investment for your company. Enhancing the look of the property can be a very cost-effective way to preserve and enhance that investment. 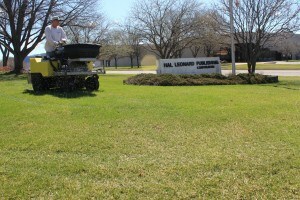 Turf Maintenance provides commercial customers with Complete grounds maintenance year-round. Our customers include apartment and condominium complexes, shopping centers, small businesses, and home owners associations. When trusting us with your landscape maintenance business, Turf Maintenance will help achieve an optimal appearance for your property. Your visitors and/or prospective tenants will have a more professional impression of your company. We will consult with you to find the personalized landscape maintenance service your property requires. Whether you own an existing facility, manage multiple properties, or construct new buildings, our experienced landscape maintenance business can help you. Providing high quality landscape maintenance and improvement including mowing, pruning, planting, edging, and fertilizing to enhance your property, is our objective. Save time and money by having the trained and certified experts from Turf Maintenance maintain your lawn, plants, and flower beds. You’ll rest assured that our reliable and dependable crew will provide prompt, courteous, and professional service.